The title of this picture can be deceiving. Why? Because it s one of three monuments located in Scotland, MD. The pictured monument is the smaller of two located within the Point Lookout Cemetery, which is currently owned by the federal government. 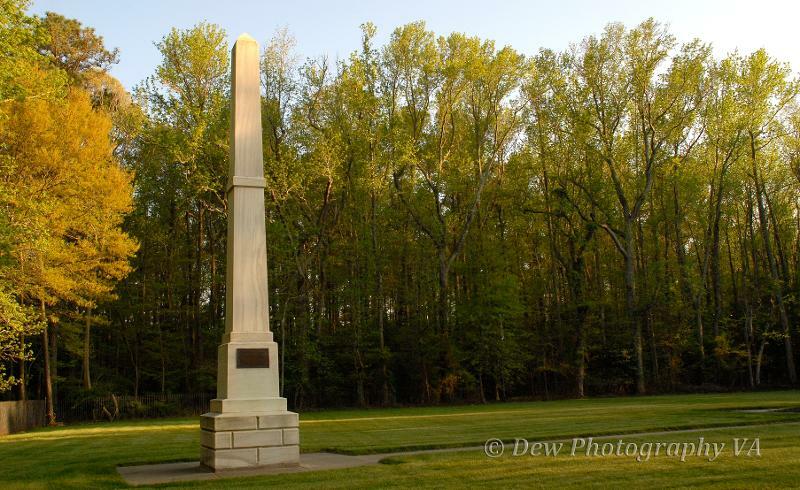 It is the monument erected in 1876 by the state of MD to mark the mass reburying of the Confederate soldiers. It can be rather eery walking in this cemetery with no marked graves. It is also sad that there seemed to be no effort put into correctly identifying the soldiers. According to the National Park Service website, after the war the remains of the Union soldiers were transferred to Arlington National Cemetery outside of Washington D.C. However, two confederate cemeteries would remain in place until 1870, when the state would transfer the remains to a mass grave now known as the Point Lookout Confederate Cemetery. The history of the Civil War for this area is a heated topic. Just a short walk down the road is a privately owned Confederate Memorial which claims many more people died in the poor conditions the soldiers/prisoners were kept under then the state or federal government record. Some even believe the mass burial and the claims of the impossibility of being able to identify the remains is all a cover up.